The Smith & Wesson BODYGUARD is an excellent choices for a concealed carry pistol. 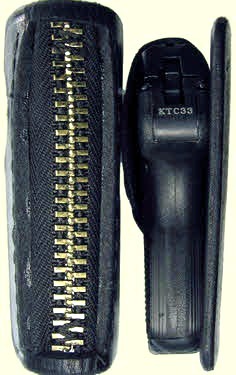 Light-weight, a thin profile with or without a built in Laser Sight make it a top choice for rear or front pocket carry. 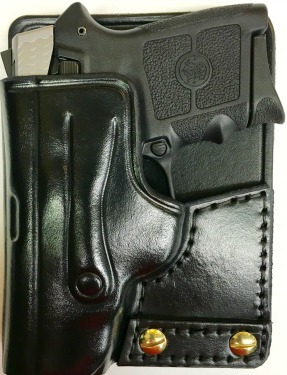 Your Smith & Wesson BodyGuard without the laser option will fit perfectly into our Pocket Holster. The below photo shows the fit of a non-lasered BodyGuard. The photo on the right is a top view of the Zipper Top Pocket Holster as compared to our standard Pocket Holster. It shows what would be seen if someone looked down into your rear pocket. 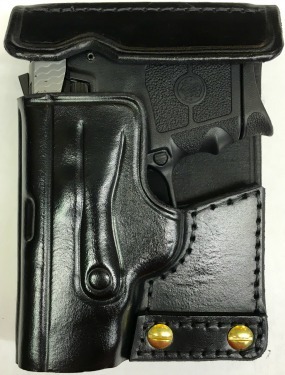 This holster is best suited for Wrangler or Levi styled jeans or other pants with smaller back pockets .